This year, I've decided to participate in Inktober - an art challenge to do one new ink drawing every day for the month of October. 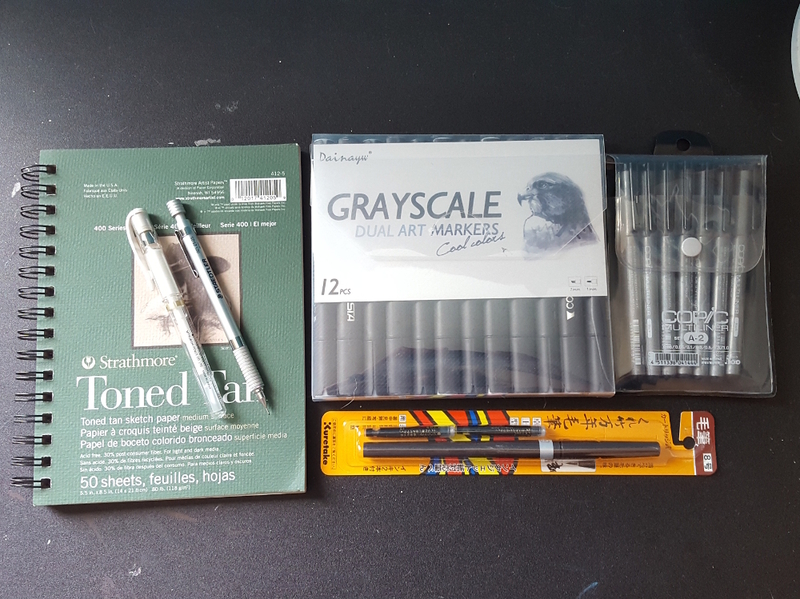 I haven't drawn in a long time, so this should be interesting. Some of these supplies are new to me, so last night I did a little playing experimenting, so I thought I'd share my first impressions. Aside from some charcoal on newsprint, I'd surprisingly never worked with toned paper before, but I really like the look. The white highlights look really striking, but of course you are somewhat limited in getting a full value range from white to black when working with ink. You could do it with pastels and possibly colored pencil though. Still, I think it's going to work well for this. This isn't my first time using these pens, but I've never talked about them before. I like Copic markers a lot, but to be honest, I'm not a huge fan of the multiliners. They're a little fuzzy compared to something like the Rapidograph technical pens I used to have. I think I also prefer the Sakura Micron pens better. I'm using them because they're what I already have on hand. For an inexpensive brush pen, my first impression of this pen is very high. It feels very smooth and you can get quite a bit of line width variation. The bristles are very soft, so it takes a gentle touch, but it's a lot of fun to draw with. Holy cheap makers! For their price, these things are amazing. I'd put them at least on par with chisel tip Prismacolors. They blend very nicely. My only complaint is that I misread the product info and thought I was getting 12 markers (well, 11 + blender) ranging from very light grey to black. Instead, you get two sets of 5 light to dark grey markers at different color temperatures, plus a solid black and a colorless blender. This means I'll have to rely on the blender more for subtle shading, but they blend so well that I don't anticipate this being a problem. There's not a lot to say about this. It's your basic gel pen, but it works well and it's smooth. I like it better than the Sakura Jelly Roll pen I'd used previously. Again, not much to say. I've had this pencil for a while now and it has a nice weight to it. Eraser refills are hard to find and expensive. If I ever care to replace the eraser, I'll probably replace the pencil, instead. If you want to see my drawings as they unfold, follow me on Instagram. Otherwise, I'll probably do a weekly round-up post here.